RV sale and purchase scams are not the norms, but they are out there. This information might help many of you avoid the RV purchase scams that could turn your dream RV vacation or RV lifestyle into a nightmare. When in doubt, seek some reliable RV buying advice from fellow RVers. There are a number of places you can buy an RV: private party; new or used dealer; or direct from a manufacturer like the Dune Sport Toy Hauler. While most are reputable, some are not. The deceptive practices of the few can be so devastating to unsuspecting buyers that it's worth taking every precaution and the time to follow through. So what are the red flags? One mistake is being rushed into a purchase, especially when you find what looks like the perfect RV. A seller might use any number of tactics to push you into buying before you learn all you need to know. Tactics can range from telling you there are other interested buyers, to this RV being one-of-a-kind, to offering you a "low" price if you buy now. Don't be fooled: if they can offer you that low price now, they can offer it anytime. In fact, they could probably offer an even lower price. The RV you want so badly is not the only one that will make you happy. Always have another in mind and let the sellers know you want time to consider both. The prices on both of them could magically drop far below what you hoped for. Other high-pressure tactics take advantage of RV owners who want to trade in their used RVs for a newer model. You can expect to be offered as much as $30,000 to $40,000 less than market value, so it's definitely worthwhile to plan ahead and consider selling your RV privately. This way you won't be pressured into taking a low offer on your RV just because you're ready to buy, now. Also, if you're shopping for a used RV keep in mind the retail value and likelihood that the dealer paid far less than wholesale for the RV you want. This gap gives you a real negotiating edge. Don't fall for the "Let me show you our purchase price for this RV" bait. Chances are you're being shown a dummy invoice or cost record that is part of a preplanned sales scheme practiced at that dealership. You may have to travel quite a distance to shop at two different Winnebago or other brand-specific dealers. The dealerships know this and will use it to their advantage. This can work against you in a couple ways, urging you to make a purchase based upon convenience, distance, dealer services and other real or perceived benefits to you. If you take the time to inspect and research the specific RV you want to buy, you can tip the advantage in your favor, and make sure you aren't pressured into making a lesser choice. 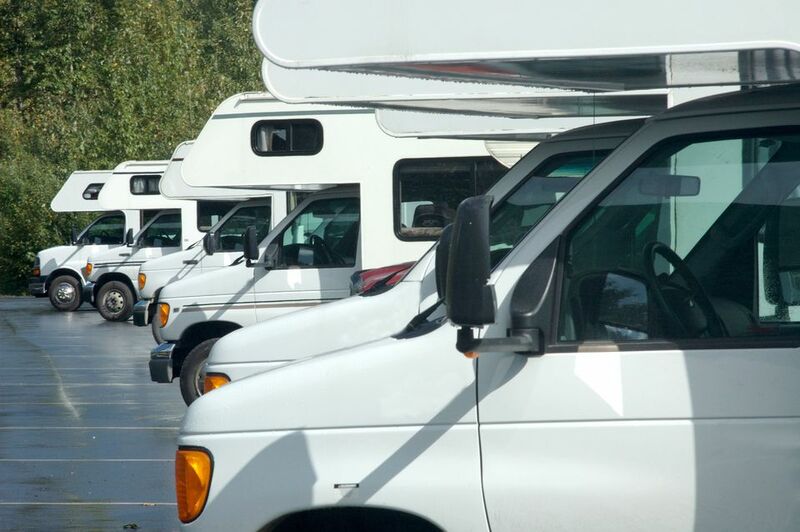 A few RV dealers have made the news because of their unethical practices. These practices involved not paying off the loans on cars or RVs they've taken as trade-ins, leaving buyers still liable for the old car loans or unable to re-title a purchased RV in their names because prior lenders still held valid liens. Other scams involve rebates that buyers were to receive several weeks after purchasing an RV, then later telling buyers that rebates fell through. In some cases, there never was a rebate, and in others, the dealer kept the rebate. If the dealer offers a rebate, make sure he applies it to your purchase price before you close the deal. If the rebate falls through then he loses out, not you. It can only encourage either honesty or good followup to make sure they get their rebate. If it doesn't fall through, it's a win-win. Some dealers ask that you let them copy your driver's license and social security numbers as security until you return an RV taken for a test ride. They don't need this information except to run a credit check without your permission or knowledge; while you are out for your test drive. Not only might they run a credit check, but they can ask several of their lenders to prequalify you, and each of them will run a credit check. Each credit check will lower your credit score, and you may not find this out until it's too late. Although the Attorney General advises against allowing anyone to copy your driver's license, if they insist on having a copy, bring one that you copied and have written clearly on that page that you do not authorize any credit checks. Include a written statement that unauthorized credit checks carry a Federal Trade Commission fines and penalties. While it's reasonable to show them proof of insurance, make sure they give all copies or your documents back to you before you leave. An alternative might be to insist that the salesperson accompany you on the test drive, or offer your car keys in exchange for theirs. Either of these alternatives should be plenty of assurance that you aren't going to steal their RV. Just make sure you know who will have your car keys ready for you when you return, and that there will be no delays in getting them back. We once had a salesman go off to lunch or a meeting, holding us up for an extra 30 minutes waiting for our keys. This is another common scheme as they use the time to continue their sales pitch. Invest some time and money in learning about the used RV you are about to buy. Take it to a reputable dealer or RV repair shop for a thorough RV inspection including an RV engine inspection and RV test drive. If you can't take it to the inspection site, find someone who makes house calls. If anything is wrong with the RV structurally or mechanically, you want to know how serious it is, and what it might cost to fix it. Also, run a vehicle history report on the RV you want. You will learn whether it has been in an accident, how serious the damage was, and if it was properly repaired. Look up the make and model of the RV you're interested in on the NADA RV price guide. Find out what the costs of any repairs will be, and negotiate a price that allows you to get repairs without investing more than the RV is worth. Updated and Edited by Monica Prelle.